The pilot of a WWII plane was killed when his aircraft crashed during an airshow display in West Sussex. A spokesman for Shoreham Airshow in West Sussex confirmed that one person died when the Hurricane went down in countryside at 1520 BST. He said no-one else was hurt or injured during the accident which took place north of the A27 on Saturday afternoon. 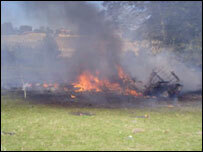 The Air Accidents Investigation Branch is expected to carry out an investigation into the crash. They were doing a mock dog fight and it looked like the plane was doing a dive, but it was going too fast and smashed straight into the ground. Tim Deakin, who saw the plane plough into the hillside, told BBC News 24: "Midway through the dogfight one of the planes, I'm not sure which one, literally, turned quite steeply, went into almost a straight dive and ploughed into a hill probably about a mile from the airfield." Spitfires carried out a flypast in the "man missing in action" formation shortly after the crash, he said. Around 20,000 people are believed to have attended the show on Saturday. Its website describes the weekend event as "one of the premier airshows in the UK". It is located at the UK's oldest licensed airport and includes a number of air displays and ground events. The theme for this year's event was the "50th Anniversary of the Battle of Britain Memorial Flight". Spectators said the airshow was delayed for about 30 minutes but organisers said over the tannoy system that the pilot would have wanted them to carry on. Eyewitness Holly Russell, from Worthing, said: "They were doing a mock dog fight and it looked like the plane was doing a dive, but it was going too fast and smashed straight into the ground. "It was nose down... There was a mushroom cloud of black smoke." Sussex Police have urged anyone with video or photographic footage of the crash to contact them.